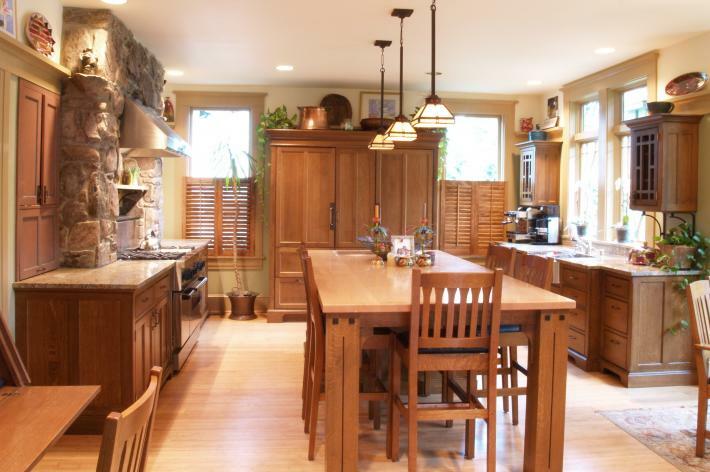 This Chevy Chase, MD craftsman style kitchen renovation was designed by its architect/owner and features unfitted quartersawn oak workstations that allow abundant light to shine in through full height windows. The large SZ30-RP-72 armoire contains a full height Subzero 700 series refrigerator, freezer and pantry. All the other freestanding workstations were made by combining YesterTec pieces to produce larger pieces. The food prep island/table workstation was made from two B48 base pieces and a custom table top. The sink workstation combined an S284 base with two flanking B18S base pieces. The architect/owner designed the pattern for the gridded glass doors of the TP18 pieces above the sink. Two more B48 pieces flank the range. Please click on the following link for more information and images about this Craftsman Style kitchen.